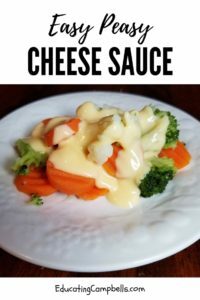 Getting kids to eat a variety of veggies at my house is like pulling teeth unless I add my easy cheese sauce to the menu. Some of them will eat potatoes, some corn-on-the-cob (forget it if it’s off), mostly everyone will eat green beans, the twins LOVE salad, and Brussels sprouts are a definite “NO,” but you throw a California medley in front of my kids and add some cheese sauce, and every kid at the table starts calling dibs on which veggies they want. It’s what I imagine the trading sounds like on Wall Street. 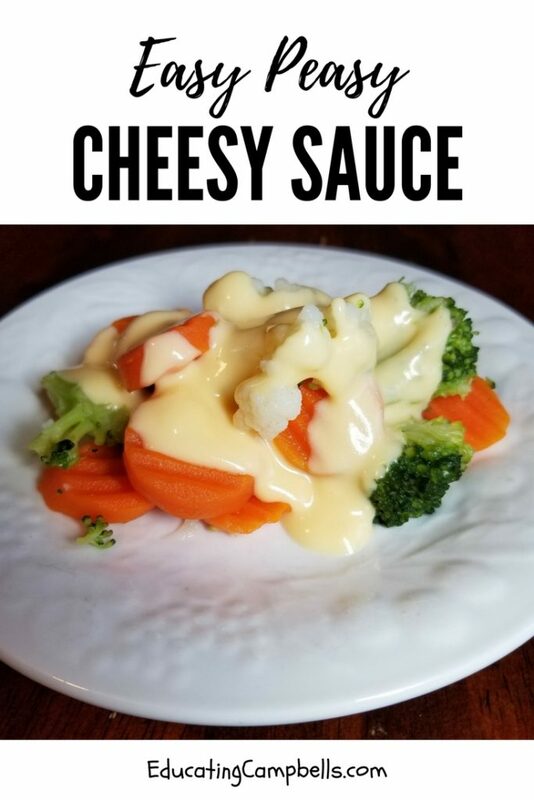 The cheese sauce is the key. It’s rich and creamy and full of cheesy deliciousness. It’s pretty simple really, and it’s so worth the few minutes I spend stirring to see my kids eating their vegetables. In a small saucepan, over medium heat, melt your butter and pour in your milk. While the milk is still cold, whisk in the flour. When the milk begins to warm, slowly add in your sliced cheese. (I tear the slices in half and add them one at a time. It could be overkill, but I can't stand the thoughts of stinky, scorched cheese.) 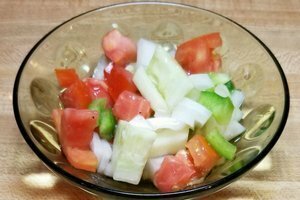 DO NOT STOP STIRRING, it will scorch if you stop stirring! Once all the slices are melted, then you can add 1 1/2 cups of shredded cheddar, again, do this slowly. 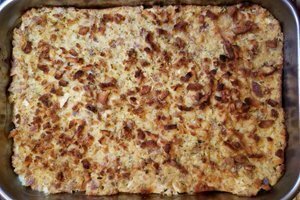 The sauce will thicken when it cools, but if it looks too thin you may add the other 1/2 cup of shredded cheddar. It just depends on how thick you like your cheese sauce. I add the salt last, and I add it to taste. The California vegetable medley with Easy Peasy Cheesy Sauce goes outstandingly well with the Large Family Chicken & Dressing Casserole. I hope your family enjoys this amazingly appetizing sauce.